In its first 10 minutes, this gruesomely funny horror film 'remake' or sequel retold (or recapped) what occurred in the first film. Ash Williams (Bruce Campbell again) had returned to the cabin in the old Oldsmobile with only his girlfriend Linda (now played by Denise Bixler), where the two found a reel-to-reel tape recorder set up and learned about archaeologist Professor Raymond Knowby's (John Peaks) discovery of the Necronomicon Ex-Mortis (or Book of the Dead) ("the doorway to another world"), with its incantations which unleased the demonic forces from the dark woods outside. When Linda became zombified, Ash beheaded her mid-air with a shovel to save himself and then buried her (although the next night, she rose naked from the grave in a reanimated state, retrieved her separated head, and performed a danse macabre for him). Ash also became possessed when propelled by invisible forces into a tree, but became normal in daylight. He struggled to fight off the pursuit of demonic forces during non-daylight hours, including an attack by Linda's head biting onto his right hand, and Linda's headless naked body assaulting him with a chainsaw. There was the startling, hallucinatory Dr. Jekyll and Mr. Hyde-like scene when last-surviving Ash Williams (Bruce Campbell) stood in front of a mirror. His reflection suddenly reached out, grabbed him, and maniacally said: "We just cut up our girlfriend with a chainsaw. Does that sound fine?" Then the reflection grabbed him by the throat and began choking him, although he was only choking himself. When his own possessed right hand threatened, it grabbed his face - and he was angered: "You dirty bastards! Give me back my hand." His hand continued to torment him - it bashed him over the head with plates, grabbed his hair and smashed his face into the kitchen sink, punched him, and tried to beat him up in a schizophrenic frenzy. It dragged his unconscious body across the floor to try and grab a meat cleaver. Ash stabbed the hand, and exclaimed to the evil body part: "That's right. Who's laughing now?" Then in the gory scene, Ash cut off his own hand with a chainsaw - spattering his face with blood, as he repeated: "Who's laughing now?" However, because his severed hand kept taunting him, he placed a bucket over it and weighed it down with books - the top-most book was A Farewell to Arms!, but it escaped and re-attacked, giving him the finger. So he blasted it with a shotgun and thought he had killed it for good: "Got ya, didn't I, ya little sucker!" - yet it sprayed him with a torrent of blood. Other additional characters that arrived at the cabin included Annie Knowby (Sarah Berry) whose archaeologist professor/father Prof. Knowby owned the cabin, and her blonde handsome boyfriend Ed Getley (Richard Domeier) - they were bringing her father's missing pages from the Book of the Dead. They were led there on an obscure trail (since the bridge was mangled), by a local redneck named Jake (Dan Hicks) and his girlfriend Bobbie Joe (Kassie Wesley) for a $100 fee. The group imprisoned Ash in the cellar suspecting that he might have killed Knowby (they saw the bloodied chainsaw), listened to more of the Professor's tape, and learned that his wife Henrietta (Lou Hancock), Annie's mother, became a demonic deadite and was buried in the cellar. When she came to life, she horrifically confronted Ash face-to-face, who successfully begged that they release him from the cellar. 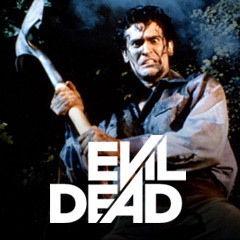 Eventually, all of the characters were killed (a demonic Ed was hacked to pieces with an axe by Ash, panic-stricken Bobbie Joe was assaulted by trees as she fled, and Jake was killed in the cellar), except Ash, who had clamped the chainsaw to his severed wrist and twirled a sawed-off shotgun into his backside-holster (and then exclaimed: "Groovy!"). In the film's conclusion, after Annie finished chanting an incantation ("You did it kid") to rid the earth of the evil deadite demons (but was stabbed in the back by Ash's severed hand), Ash was sucked and propelled into a whirling portal or rift, along with his '88 Oldsmobile and other objects, into a time-travel journey to the Middle-Ages, ca 1300s. There, he was surrounded by knights in armor (Crusaders) on horseback. They believed that Ash was a fearsome deadite, but when he blasted the head of a real flying deadite with his shotgun, he was worshipped as a liberating hero and savior by all of the knights: "Hail, he who has come from the sky to deliver us from the terrors of the deadites. Hail! Hail!..." -- horrified, Ash repeatedly screamed: "Nooo!" as the camera pulled back, and the screen turned to black for the closing credits. With a production budget of $3.5 million, and box-office gross receipts of almost $6 million.